Is the use of mobile apps in heritage contexts enhancing or impeding? A group of Masters degree colleagues, undertaking the Cultural Heritage Management module, had the opportunity to visit Newcastle’s Tyne and Wear Discovery Museum to hear about, and try out, some of their approaches to developing different ways for people to use their collections. The mission of the museum was displayed in the room in which we met; to help people determine their place in the world, define their identities so enhancing their self-respect and their respect for others’ and an important part of the work is about inspiring new audiences to reuse and reimagine the museum’s collections. Behind this, and many other initiatives within the heritage sector, there are ideas about increasing access. But ‘increasing access’ although it sounds hard to argue with, is a problematic idea especially within the context of initiatives that use digital solutions. We need to think about whose access is being increased and in what ways, are some people’s access being reduced at the expense of others and how do we know that people want their access increased, moreover how can we even tell if it has been increased. This post aims to explore some of these ideas by deconstructing our day in Newcastle and reflecting on the ways in which other examples of digital technology tackle issues of access — whether physical, intellectual or emotional. 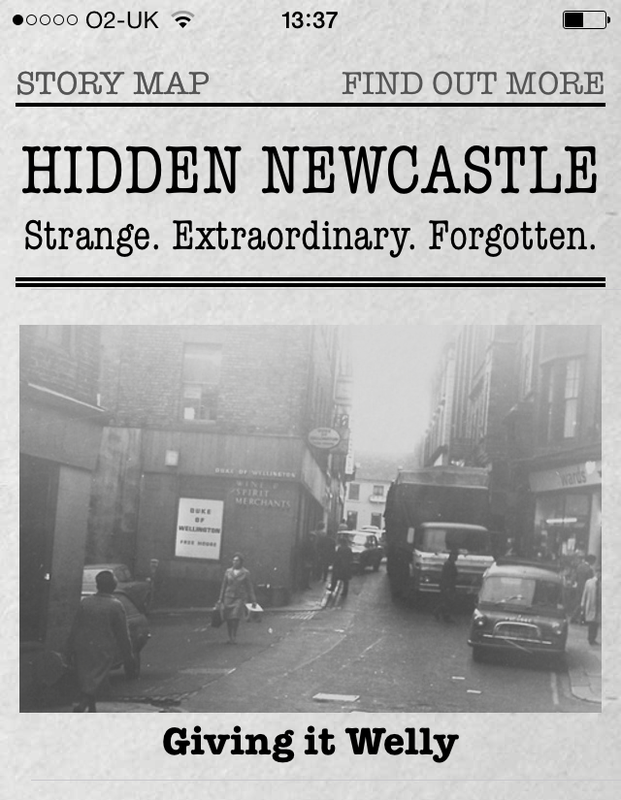 One of the apps produced by the Tyne & Wear Archives and Museums, Hidden Newcastle, aims to give users a look at the lesser known history of the city in the locations that the various events took place. In order to do this, the app –which is available for iOS and Android devices- sends the user notifications whenever they are near one of these locations, which then links to the story, accompanied by historic photographs and often an audio feature, and puts a pin on a map of Newcastle. Hidden Newcastle app opening screen. Overall, an interface and functionality such as this targets local users as opposed to tourists and visitors for whom certain aspects are largely inaccessible. This is due to the fact that using the app to its full potential requires the user to have background knowledge and a frame of reference for what the city centre of Newcastle is physically like. The lack of an accompanying web or printed resource means that people who do not have access to the right type or version of smartphone, let alone those who have no smartphone at all, cannot experience this material. As well, the geographical reality of the city with hills, some of which are very steep, prohibits those with mobility issues to use the app as it was intended. 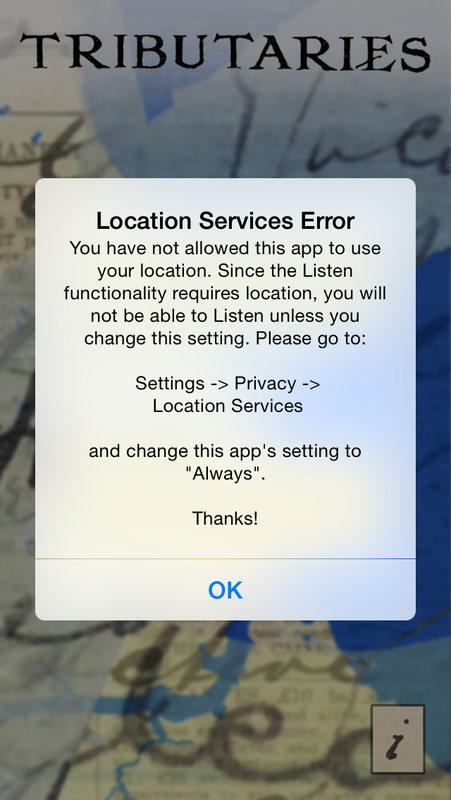 Example error screen on the Tributaries app where the content is only available at the set location. The second app experienced on the day was the Tributaries app. The initial downloading of the app came with no complications from both the Google Play Store and the Apple App Store, with the app easily findable and uncomplicated to download. However, on the day, issues of connectivity arose, with one colleague attempting to activate their wi-fi function on their smartphone in the hope of connecting to a free wi-fi network. However, this was not possible and therefore to use the app users have to activate the 3G functions on their phones in order for the app to function as intended. Another colleague experienced several technical difficulties. Firstly, when activating the Tributaries app, they received only a blank screen. After deactivating and reactivating the app 3 times, a “Roundabout Error” notification appeared on the screen. After attempting to close this notification and continued attempts to get the app working, it continued to malfunction until the colleague received a message from their network provider that their credit for the 3G function had been used up, and therefore the app became inaccessible. These complications, may have been the result of an older model of smartphone or a corruption of code in this copy of the app, however these complications highlight multiple issues with digital applications. For the app to function as it is meant to, it requires the user to firstly have a British phone contract and secondly that the aforementioned contract offers unlimited 3G credit. With these requirements non-British tourists will be excluded in the full use off the app unless they are willing to pay extra on their visitor contracts. This issue of cost also stands for users with British phone contracts, and is partly at odds with the cost-free download accessible nature of the app itself. Moreover, the fact that the majority of these app’s material is location sensitive and can only be accessed if the user allows the application to ustilise the mobile’s ‘Location’ services, meaning that audiences can only experience and engage on site. This then excludes the possibility of long term engagement of the material as audiences are unable to experience the apps at other times, which is a shame considering those who are perhaps physically unable to get to the locations are excluded from the experience altogether. Are there successfully accessible apps out there? In many cases, the use of mobile apps for heritage scope has become a useful tool for museums and cultural heritage organizations, allowing the spread of information and increasing the visibility of a particular organization.This broad use of mobile application is highly connected with the diffusion of smartphones, which are an outstanding source in terms of heritage usage. In fact, it is noteworthy to point out the incredible amount of cultural heritage apps within digital distribution platform such as App Store and Google Play. Another interesting use of mobile application is the creation of apps that use gaming technology as a tool for improving the visibility and engaging people with particular heritage issues. A remarkable example is the Auckland Castle app, which has been developed by The Centre for the Study of Christianity and Culture based in York. This app uses 3D reconstructions that can be easily explored by the visitor while visiting the actual chapel and also this application allows to see how the chapel would have been in the past. In addition, it is important to highlight the importance of a solid organization behind the creation of a mobile app in terms of quality and sustainability of the application. 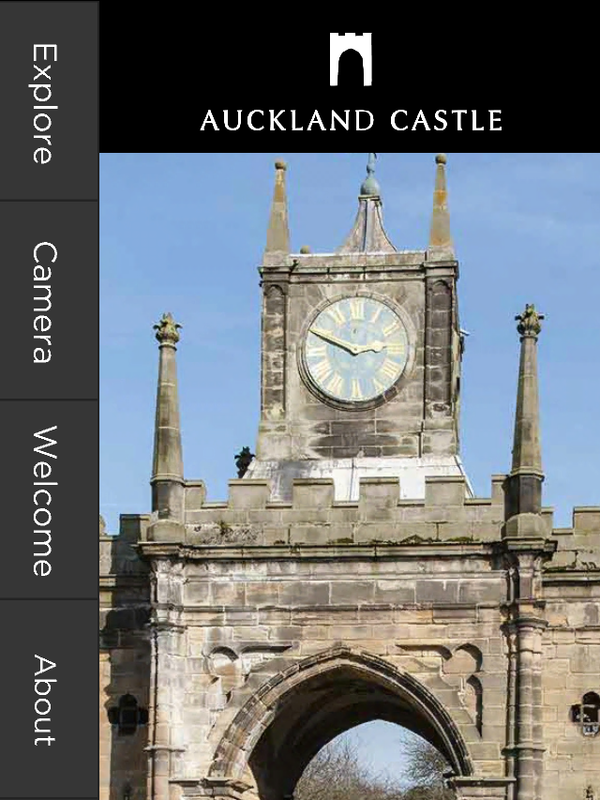 Auckland Castle’s app opening screen. Evidently, digital technology creates its own accessibility issues and, despite attempting to create informed and multisensory engagement, can exclude many different people on the basis of age, language or technology. Accessibility can also exclude people with disabilities and attempts have been made to enhance accessibility for visually impaired users and those with hearing difficulties. The Tate Modern introduced a Multimedia Tour in British Sign Language where they were able to hear from the artists themselves and were able to view video clips. Content had to be rewritten to fit with British Sign Language which has a different conceptual and linguistic structure to English. Other useful tools for the visually impaired include audio description and the narration of visual elements, which can easily be pre-recorded and assimilated into apps, but the various advantages and disadvantages of this must be considered in certain environments. The Victoria and Albert Museum has taken active steps towards improving access to blind and partially sighted audiences by utilising audio descriptions of objects which can be downloaded from their own smartphones. It would be interesting to incorporate some of these ideas into apps such as those at Newcastle, which aim to furnish their uses with a deeper understanding of the city surrounding them. Through these multiple case studies, this post has considered accessibility of heritage apps on two levels; firstly in terms of the overall audience and the basic functionality and requirement of digital apps and more precisely issues of accessibility relating to disabilities, such as mobility issues, visually impaired users, and those with hearing difficulties. All digital apps require the possession of a smartphone, and as the difficulties with the Tributaries app proved, one that is up to date, and for many apps one that has a 3G function allowing internet access. This is problematic, and on many levels is exclusionary on grounds of cost. As previously highlighted, this is at odds with apps which are free to download and therefore claim to offer a free, accessible experience. One improvement of the Newcastle app would be the establishment of a city-wide WI-FI zone, however the cost implications of this would be high and therefore unachievable. The balancing up of costs is extremely relevant in issues of accessibility in the development of digital apps and applies even more to issues of disability access. Development costs of digital apps are extremely high and the inclusion of multiple adaptations to cover the grounds of hearing and visual impairment would raise the costs even higher or prevent the development of an application at all as the software may become too complex for smartphones. However, accessibility is exceptionally important within the heritage sector and as previously mentioned smartphones and digital apps are a brilliant tool for unlocking new forms of engagement. But, do they really unlock new forms of engagement if they are so many issues in accessibility? Can organisations justify such huge development costs when the apps are not accessible for all audiences? The TATE Modern and V&A are prefect examples where both engagement and accessibility has been achieved, proving that this balance is possible. Digital heritage apps are in their early stages of development, however, to proceed forward, it is apparent that issues in accessibility need to be carefully considered and negotiated within application development. Authors: Gill Bull, Laura Saretsky, Jason Kosh, Amedeo Viccari, Veronica Smith, Aimee Hardy, Olivia Morrill.